Give the gift of nuts. Heat the nuts in a cast iron skillet until they are toasted. Remove the nuts and wipe out the skillet. Add the butter, sugar, water and spices to the skillet. Stir the ingredients until the sugar and butter are melted. Add the nuts back and stir until well coated. Spread the nuts on parchment paper and let cool. 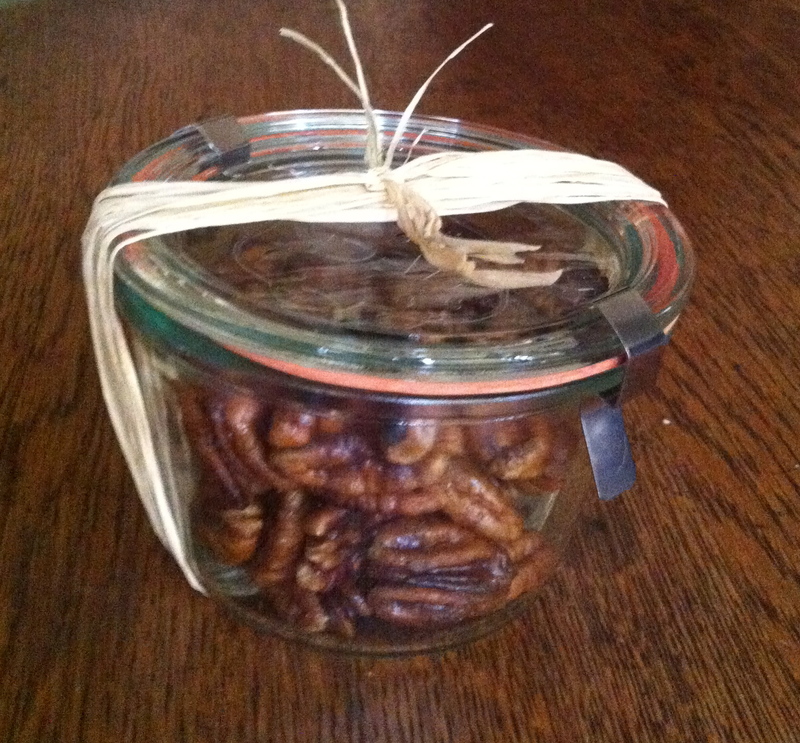 Once the nuts are cool package in pretty, airtight containers. This is an easy homemade gift that anyone can do. You can change the spice mixture to make different flavored nuts — this is just a starting point. Enjoy! These days every where you look you see buy local, buy fresh, shop at Farmer’s Markets, and so on. Buying local and fresh is great. However many of us don’t have time to shop every few days, so I have some tips to help keep what you’ve purchased last longer. If you plan ahead and allow a little extra time after you shop to package and prep items you will find you can shop less often and still eat great food. Bread: Buying local fresh made bread is great but it doesn’t last long. One trick I use is to freeze bread. If I buy a loaf of fresh bread I ask the baker to slice it for me and then I freeze it the same day I bring it home (minus what will be used that day). I usually freeze the slices in heavy ziplock bags, then when I need a couple of slices I take out what I need, wrap it in foil and pop it in the oven (toaster oven’s work great for this) at about 350 degrees for 5 – 10 minutes. I will also freeze baguettes. I will cut a fresh baguette into sandwich length pieces and wrap each piece in foil and then freeze the individual pieces. When I need a baguette for a sandwich, garlic bread or just to eat I pop the frozen baguette piece in the oven, and in less than 10 minutes I have fresh bread. Bagels: Bagels freeze well in freezer bags. I usually do not pre-slice the bagels. I will put the frozen bagel in the microwave for about 15 seconds (just until it is soft enough to slice) then I slice and toast. Pastries: I will also freeze muffins and scones that I have either purchased or made from scratch. Take the fresh (must be at room temperature before freezing) pastry and wrap each one in foil (remove any paper first) and freeze. Then when you want a fresh muffin just pop one in the oven for 10-15 minutes at 350 degrees. Fresh Produce: Buy extra produce you really like when it is in season and at its peak. Take the extra produce and freeze, preserve, pickle and/or make sauces and soups with it. Fresh berries freeze well. Gently rinse and dry off the berries and then spread out on a flat tray that you can slip in your freezer. Once the berries are frozen you can store the berries in air tight containers in the freezer. Tomatoes can be slow roasted and/or made into sauce and then frozen. Carrots and celery can be washed and prepped for snacking on the go. Put the cleaned and prepped vegetables in a container with cold water in the fridge. The water will keep the vegetables fresh and crisp. Change the water every day or so. Bell peppers can also be cut in strips and stored in the fridge in a container between damp (paper) towels. Lettuce and leaves of fresh basil can be washed and dried then layered in (paper) towels and kept in a container in the fridge. Garlic is great when peeled and kept in oil in the fridge. You can use the garlic in cooking or just the flavored oil. Fresh Herbs: Soft herbs like cilantro, tarragon, sage and basil can be pureed with (olive) oil and then frozen in ice cube trays. Once frozen the cubes can be stored in the freezer in labeled containers or freezer bags. Then when you need to flavor a dish just pop in a cube of the frozen herb. Hard herbs like rosemary and thyme can be frozen in ziplock bags. First clean and dry the herbs, then place in a small freezer bag and freeze on the stem. They can be kept on the stem or once frozen it is easy to remove the leaves from the stems and then seal the leaves in small bags or containers in the freezer. Remember to always label and date frozen food. Also, in the refrigerator and in the freezer make sure the older items are used first by keeping the older items in the front and the newer items in the back. Every week or so go through your refrigerator and throw out anything that is expired. Here is a basic guide to how long many items will last in the refrigerator: Storing Fresh Food Audit your freezer about every month. Whether you are moving to your first home or just doing some Spring-cleaning, having a well-stocked pantry can make throwing together a quick meal much easier. When cleaning out your pantry (which could be one cabinet to a walk-in closet, preferably away from heat and light), take out everything and check for expired items. Dispose of any expired items and donate any items you no longer use (unless the containers are open). Next, put dry goods in airtight containers that are labeled with the date. 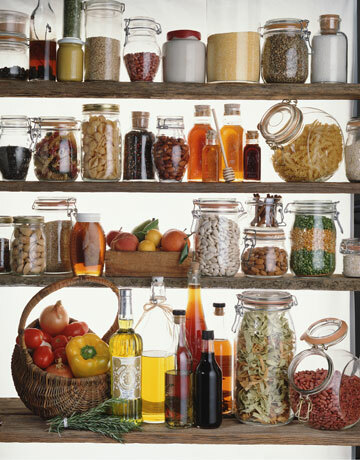 Then, organize your shelves by like items (oil and vinegar on one shelf, pastas and grains on another, etc.) Below you will find a list for stocking or re-stocking your pantry. You will then be able to create meals on the fly even if your fridge is bare. This will come in handy if there is a natural disaster, as well. I was not a fan of coleslaw until I discovered spicy, no mayo coleslaw. 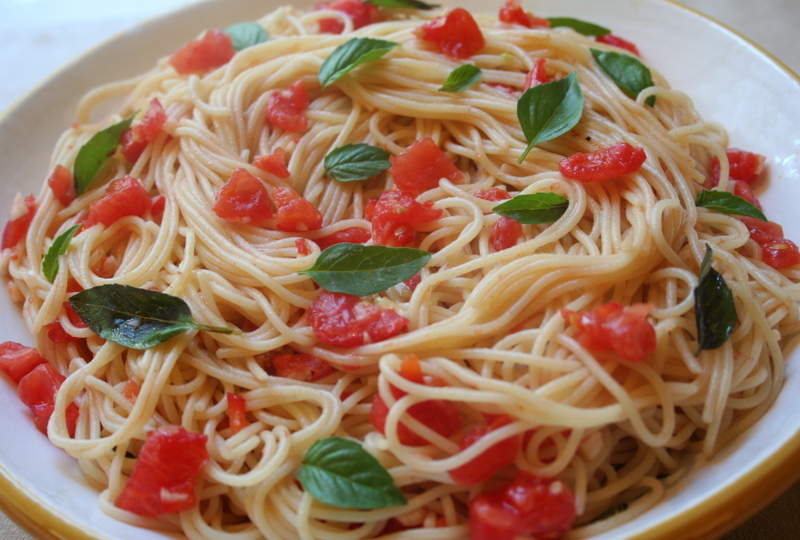 Here is a quick and healthy recipe. It goes great as a side dish or as a condiment to sandwiches: pulled pork, fried chicken, sausages, etc. Make a dressing with the olive oil, lemon juice, salt, pepper and cilantro. 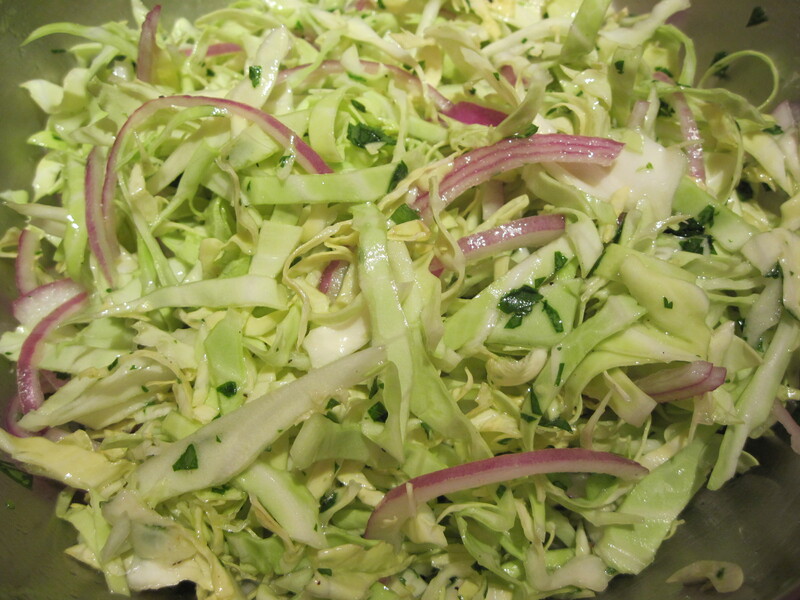 Pour the dressing over the cabbage, onion and chili. Mix well and let sit for about one hour. Adjust seasoning as needed. I don’t know why it took me so long to purchase an immersion blender, they really reduce cleanup time and speed up the soup making process for pureed soups. I went with the basic Cuisinart CSB-76 Smart Stick Hand Blender, because I was mainly planning to use it to make pureed soups. The Cuisinart CSB-76 was about $30 and well worth it. If you are going to use yours for ice or on raw food you might consider a model with a stronger motor. I love products that simplify tasks, before I purchased the immersion blender I would end up with several dirty pots and a dirty blender when making pureed soups. Now all I have to do is blend right in the pot and when I am done the hand blender comes apart so I can either hand wash it or put in the dishwasher. The soup making time and the cleanup time are greatly reduced.